If the potential hassle and stress of planning a party is keeping you from hosting an unforgettable event, consider these 7 tips for stress-free parties. Employ as many of the tips as you can, and pulling off your party will be a breeze. Make every attempt to only plan parties that you want to plan. That's not to say that you'll always have an option. If the family asks you to be in charge of great-grandma's 90th birthday party, you might not be able to say no. 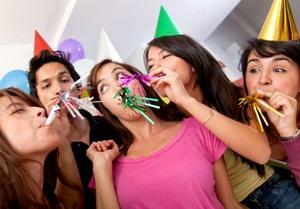 However, a party that you're excited to host is much more likely to result in a stress-free experience. Lists will help you organize your thoughts and make sure you don't forget any important details. It may take some time to create the lists, but they will be well worth the investment. The most essential list is a to-do list with deadline dates for accomplishing tasks. Depending on the party, you may also need several shopping lists for food, decorations, and other details. A to-do list is even important on the day of the party, especially if you are cooking food and need to coordinate oven temperatures and times. If you wait until the last minute, your party-planning experience will be much more stressful. Planning is important at every step of the process. If you don't send your invitations out at least a month ahead of time, you will add stress to your menu planning because you're unsure of the number of guests attending. Rushing to the store in the hours before the party to pick up a few more things only leaves you frazzled and stressed out in the moments before guests arrive. Of course, it would be wonderful if everyone could afford a professional party planner, a decorator and a full catering staff for every important celebration, but that's just not practical. However, a little hired help can go a long way, whether you're contracting with a landscaper to create the perfect setting for your outdoor party or calling a babysitter for a few hours to keep the kids out of the way while you cook. It may seem counterintuitive to relieve stress by adding one more task to your to-do list. However, if you spend the entire night worrying about whether guests are going to see the dust on your bookshelf as they mingle or notice the grime in your shower when they use the bathroom, you won't be able to relax and enjoy yourself. Clean the house thoroughly before your party and remove this potential source of stress. You don't have to feel like an inferior party host if you take some shortcuts. Will a can of chili work just as well on top of those nachos as your uncle's famous recipe that takes five hours to prepare? Will guests care if you use disposable plates instead of breaking out the fine china? By doing a few things "the easy way" you can devote your time and attention to those aspects of the party that matter most to you. There comes a certain point in throwing a party when you just have to let go and accept that you have done your best to prepare a wonderful celebration; whatever happens after that point is out of your control. Step away from your hosting duties for a second, grab a drink or snack, and just spend some time with your friends and family. After all, these 7 tips for stress-free parties are all about letting you enjoy the celebration you worked so hard to plan. Whatever the reason for your celebration, if you keep these ideas in mind, you can take the pain out of the party planning process. This will help you breathe a little easier, and enjoy every moment of your gathering.